The Park Avenue Armory, which is hosting an art exhibit featuring films of what the armory itself calls "graphic sexual acts," is offering conflicting information about whether state and city taxpayer dollars supported the show. Writing in the New York Post's Wednesday edition, my friend and former colleague Seth Lipsky reported that an armory spokesman said no federal money funded the show, though tens of millions had gone to support the space it is in. Yet at the exhibit on Wednesday, armory officials at the information desk in the lobby were distributing copies of the 2013 "Season Program," which, on the page devoted to the "WS" show by artist Paul McCarthy, states, "This installation is supported, in part, by public funds from the New York State Council on the Arts with the support of Governor Andrew Cuomo and the New York State Legislature and the New York City Department of Cultural Affairs in partnership with the NYC Council." The program also lists Citigroup and Bloomberg, L.P. as season sponsors. 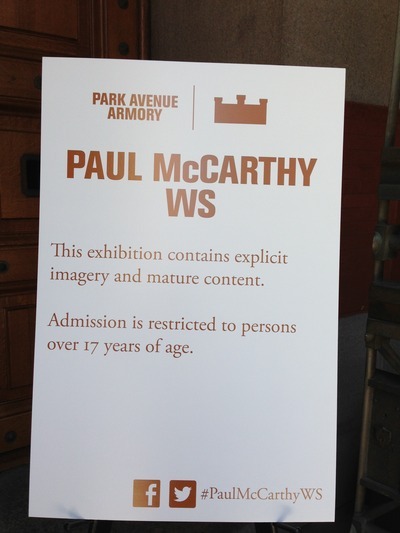 A sign outside the Park Avenue Armory warns of "mature content." The exhibit itself includes one video of a Snow White-like character, her red tights and white underpants rolled down around her knees, who slathers her crotch with Pillsbury Creamy Supreme chocolate frosting, then licks the spatula. Another video features footage of a man — the program explains he is a "prince" — copulating with a rubber doll, which is on display in a refrigerator case elsewhere in the armory. Other videos feature a male Walt Disney-like character naked from the waist down. The naked human body has been a subject of art going back to ancient Greece and Rome, and in Manhattan in 2013 the standards for achieving shock value are pretty high, or low, depending on how you look at it. The show can be seen to be attacking the objectification of women rather than participating in it. Disney is a sufficiently powerful and respected force in American culture that it isn't going to be appreciably damaged or diminished by a modern art exhibit mounted by a non-profit organization on the Upper East Side. But it is something that in New York, the concern for employee health that led to a ban on cigarettes in bars so that waitresses weren't exposed to second-hand smoke doesn't seem to extend to the staff members of the armory, who have been assigned to patrol the viewing areas while signs warn, "The films in these rooms contain graphic sexual acts." And it is something, too, that the state and city governments have reportedly put $47 million into turning the armory into a center for what an exhibit program describes as "unconventional works" that "shatter traditional expectations." One traditional expectation not shattered by this spectacle is the one that says no matter how far-fetched a project may seem, New York politicians will still manage to find some way to dump tens of millions of taxpayer dollars on it.